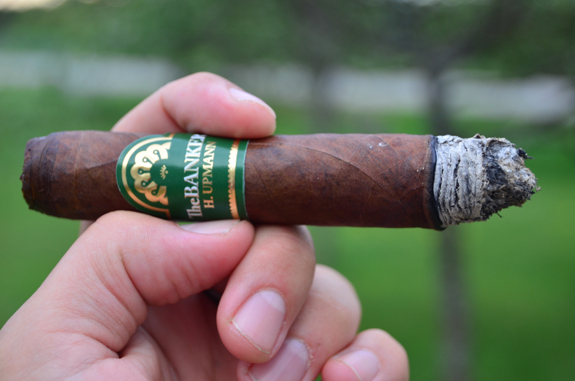 As the IPCPR’s 82nd Annual Convention and International Trade Show came to a close mid-week, I lit up a newer release from Altadis U.S.A., The Banker by H. Upmann. 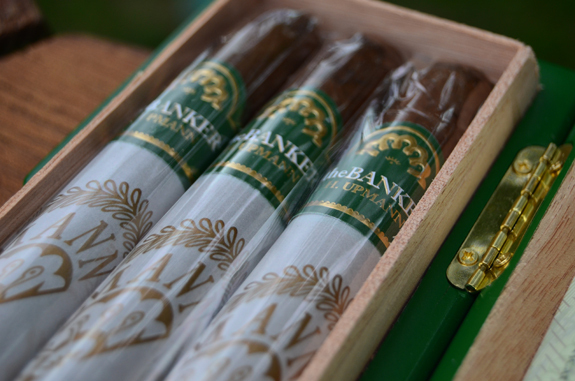 Produced in the Dominican Republic, The Banker is available in three vitolas: (5 by 48), Annuity (6 by 52), and Arbitrage (7 by 56). The Banker has a dark brown wrapper that a good amount of oils that can be felt on my fingertips. The green band looks great against the dark leaf. The wrapper is smooth to the touch with mainly small veins across the leaf. 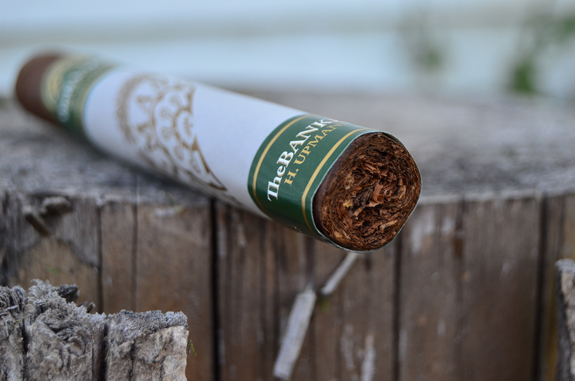 The wrapper aroma is of raisin and chocolate, while the foot gives off a very pleasant mixture of chocolate, caramel, barnyard, and raisin. The caramel flavor reminds me of an irish cream. Since these cigars arrived in three-count boxes, I am surprised to find a large indentation on the stick. 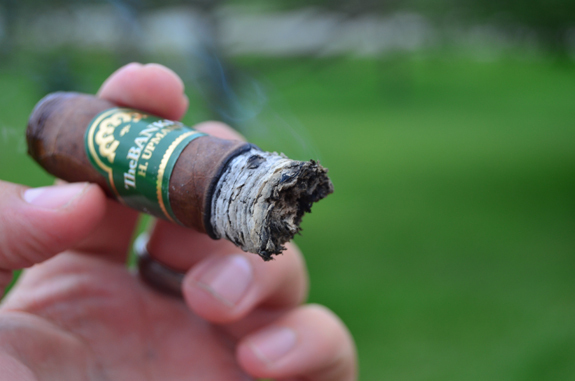 Other than that, the cigar gives just slightly when pressed. Clipping through the double cap, I find a cold draw that is a hair more firm than preferred. The flavors on the cold draw match up to the foot aroma with some added spice. The Banker begins with a hearty profile of leather and earthy notes accompanied by a bed of spice. On the back end of the flavors, some dry cedar is found, which really stands out the retrohale, along with peppery spice. Just past the inch mark, chocolate begins to peek through on the finish of the smoke. 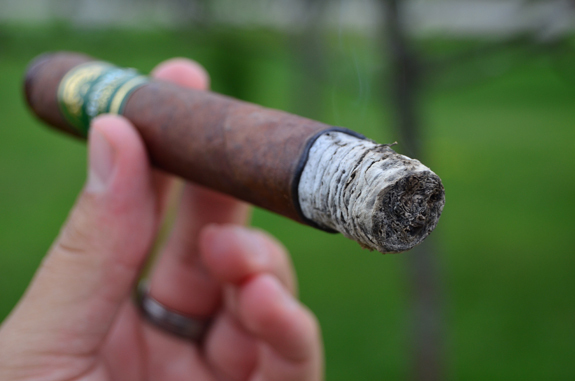 The burn is a bit wavy, producing a layered, white ash that is holding firm well past an inch. I am beginning to feel a medium amount of nicotine as I round out the first third. The pepper has kicked up a notch and some additional sweetness is balancing out the heavier flavors as I arrive in the second third. As the flavors develop, the earth and leather move to a toasty bread-like flavor and the chocolate becomes more syrupy. The strength and flavor are in-line with each other at this point being at the low end of full. The nicotine is starting to make me feel a bit ill with a couple inches remaining in the cigar. But being a professional, I am going to push it to the very end. The earth flavor has stepped back in, the toasted bread is holding strong, and the chocolate continues to gain ground. I was caught completely off guard with the strength being a solid full. 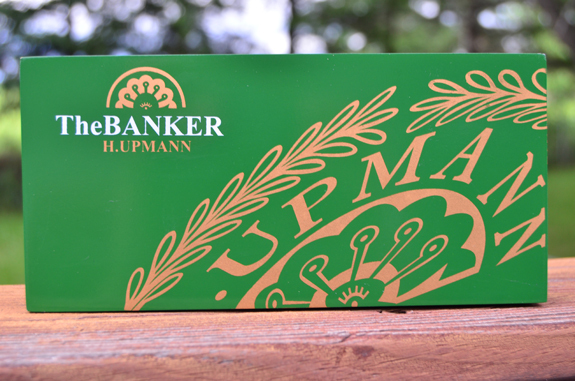 The Banker by H. Upmann has a lot to offer at an affordable price. While it was a departure from what I would normally expect from Altadis, I was not disappointed with the direction they went with this stick. 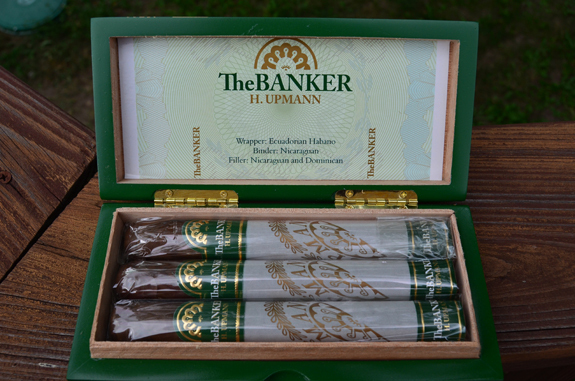 The Banker delivered a full flavor, full strength cigar with heavy notes of leather and earth, balanced out with the sweeter chocolate notes. While the profile became a bit odd with the toasted notes and syrupy chocolate mixture, all in all the flavors were good and satisfying. 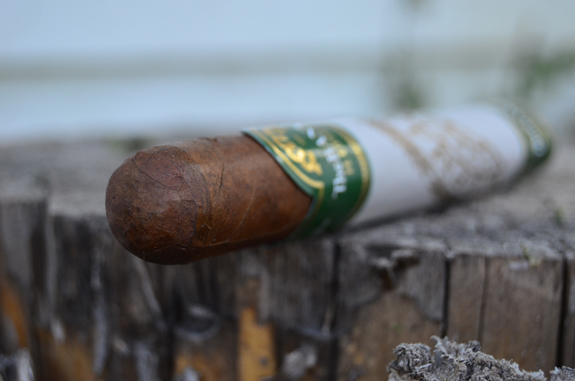 For the price, I would recommend that you give this cigar a shot. I have a few more in the humidor that I am already looking forward to smoking.